Clean CARFAX - No accidents - Fully Serviced - QUALITY CERTIFIED up to 10 YEARS 100,000 MILE WARRANTY This Audi includes: SPORT INTERIOR PACKAGE Transmission w/Dual Shift Mode Heated Front Seat(s) Passenger Adjustable Lumbar Bucket Seats PANORAMA SUNROOF Generic Sun/Moonroof Sun/Moonroof Dual Moonroof TECHNOLOGY PACKAGE HD Radio Navigation System CD Player Rear Parking Aid Back-Up Camera AM/FM Stereo Satellite Radio Blind Spot Monitor Hard Disk Drive Media Storage MP3 Player PREMIUM PLUS PACKAGE Mirror Memory Seat Memory Auto-Dimming Rearview Mirror Power Door Locks Keyless Entry Power Folding Mirrors HEATED FRONT SEATS Heated Front Seat(s) RADIO: AUDI MMI NAVIGATION PLUS SYSTEM HD Radio Navigation System CD Player AM/FM Stereo Satellite Radio Hard Disk Drive Media Storage MP3 Player *Note - For third party subscriptions or services, please contact the dealer for more information. * This Audi Q5 Premium Plus Quattro - Clean CARFAX - No accidents - Fully Serviced - QUALITY CERTIFIED up to 10 YEARS 100,000 MILE WARRANTY has a tough exterior complemented by a well-designed interior that offers all the comforts you crave. This Audi Q5 features AWD. That means power and control delivered to all four wheels for maximum grip and improved handling. It's not often you find just the vehicle you are looking for AND with low mileage. This is your chance to take home a gently used and barely driven Audi Q5. Marked by excellent quality and features with unmistakable refined leather interior that added value and class to the Audi Q5 Where do you need to go today? Just punch it into the Audi Q5 on-board navigation system and hit the road. You don't always know the details about a vehicle's past. This time you will have the service records to clue you in to how well it was cared for. This pre-owned Audi Q5 looks like new with a clean interior that's been well-kept. Speed is a game changer and this awesome machine is so fast it didn't just change the game, it rewrote all of the rules. 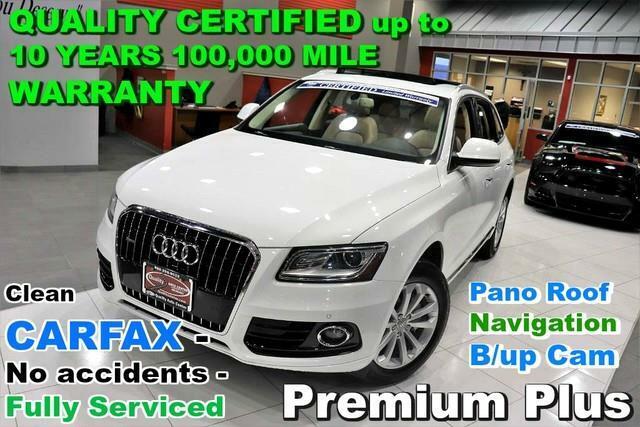 This 2015 Audi Q5 Premium Plus Quattro - Clean CARFAX - No accidents - Fully Serviced - QUALITY CERTIFIED up to 10 YEARS 100,000 MILE WARRANTY is not like every other automobile. The Audi was equipped with many of the added features that make this vehicle such a unique automobile to own and drive. This vehicle has been well-cared for inside and out. The paint is flawless with no damage or obvious signs of wear. This is your chance to own the very rare Audi Q5. More information about the 2015 Audi Q5: With the 2.0 TFSI engine and 8-speed automatic, the 2015 Audi Q5 performs similarly to its V6-equipped big brother while being much more fuel-efficient. The standard Q5 has an EPA highway rating of 27 mpg. The Q5 has the longest wheelbase in its class and that gives it an especially smooth, settled ride. With either 3.0L V6, the Q5 has an excellent towing capacity as well. The Q5's rear-biased quattro all-wheel drive system brings more driving enjoyment than is typical for enthusiasts and those who might rather be driving a sport sedan, while the interior has just as much versatility and flexibility as other utility vehicles in this class. Add to the mix a 2.0L hybrid -- or even the potent SQ5 -- and the appeal of the Audi Q5 is hard to ignore. This model sets itself apart with excellent towing capability, strong safety feature content, available Audi Drive Select customization, Strong performance, excellent ride quality, and hybrid fuel economy No Credit / Bad Credit / No Paystubs, No problem !! ! All Approved ! Everyone drives ! CLEAN, GORGEOUS, LOW MILES, SHOWROOM CONDITION. CALL NOW QUALITY CERTIFIED up to 10 YEARS 100,000 MILE WARRANTY , To Certify a vehicle, there will be an additional cost for Certification. CALL NOW For details. STUNNING AGGRESSIVE LOOK ON THIS BEAUTIFUL--Call today to schedule a test drive... Good Credit/Bad Credit/No problem!!!! Get paid cash? No problem!! 100% Credit Approval with interest rates starting at 2.49% for qualified customers, our rates will not be beaten. We price our cars at wholesale price to guarantee the best deals for our customers. Our inventory moves quick, please call to confirm the availability of the vehicle of your interest Springfield location 973-564-0112. This vehicle is located at our SPRINGFIELD location. Come visit our new showroom in Springfield NJ. Quality Auto Center has a wide selection of exceptional pre-owned vehicles to choose from, including this 2015 Audi Q5. With this exceptional SUV, you'll get sport, utility, and comfort. Take home this 2015 Audi Q5 and enjoy the safety and added performance of AWD. You can tell this 2015 Audi Q5 has been pampered by the fact that it has less than 25,672mi and appears with a showroom shine. More information about the 2015 Audi Q5: With the 2.0 TFSI engine and 8-speed automatic, the 2015 Audi Q5 performs similarly to its V6-equipped big brother while being much more fuel-efficient. The standard Q5 has an EPA highway rating of 27 mpg. The Q5 has the longest wheelbase in its class and that gives it an especially smooth, settled ride. With either 3.0L V6, the Q5 has an excellent towing capacity as well. The Q5's rear-biased quattro all-wheel drive system brings more driving enjoyment than is typical for enthusiasts and those who might rather be driving a sport sedan, while the interior has just as much versatility and flexibility as other utility vehicles in this class. Add to the mix a 2.0L hybrid -- or even the potent SQ5 -- and the appeal of the Audi Q5 is hard to ignore. Interesting features of this model are excellent towing capability, strong safety feature content, available Audi Drive Select customization, Strong performance, excellent ride quality, and hybrid fuel economy No Credit / Bad Credit / No Paystubs, No problem !! ! All Approved ! Everyone drives ! CLEAN, GORGEOUS, LOW MILES, SHOWROOM CONDITION. CALL NOW QUALITY CERTIFIED up to 10 YEARS 100,000 MILE WARRANTY , To Certify a vehicle, there will be an additional cost for Certification. CALL NOW For details. STUNNING AGGRESSIVE LOOK ON THIS BEAUTIFUL--Call today to schedule a test drive... Good Credit/Bad Credit/No problem!!!! Get paid cash? No problem!! 100% Credit Approval with interest rates starting at 2.49% for qualified customers, our rates will not be beaten. We price our cars at wholesale price to guarantee the best deals for our customers. Our inventory moves quick, please call to confirm the availability of the vehicle of your interest Springfield location 973-564-0112. This vehicle is located at our SPRINGFIELD location. Come visit our new showroom in Springfield NJ.